Thermistors are thermally sensitive resistors whose prime function is to exhibit a large, predictable and precise change in electrical resistance when subjected to a corresponding change in body temperature. Negative Temperature Coefficient (NTC) thermistors exhibit a decrease in electrical resistance when subjected to an increase in body temperature and Positive Temperature Coefficient (PTC) thermistors exhibit an increase in electrical resistance when subjected to an increase in body temperature. U.S. Sensor Corp.®, acquired by Littelfuse in 2017, produces thermistors capable of operating over the temperature range of -100° to over +600° Fahrenheit. Because of their very predictable characteristics and their excellent long-term stability, thermistors are generally accepted to be the most advantageous sensor for many applications including temperature measurement and control. Since the negative temperature coefficient of silver sulphide was first observed by Michael Faraday in 1833, there has been a continual improvement in thermistor technology. The most important characteristic of a thermistor is, without question, its extremely high temperature coefficient of resistance. 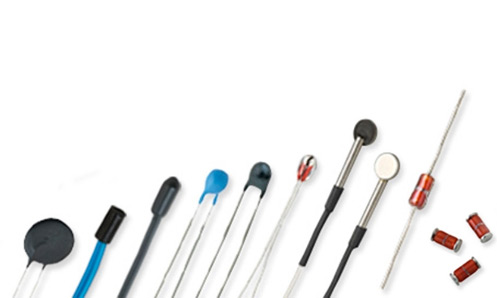 Modern thermistor technology results in the production of devices with extremely precise resistance versus temperature characteristics, making them the most advantageous sensor for a wide variety of applications. A thermistor's change in electrical resistance due to a corresponding temperature change is evident whether the thermistor's body temperature is changed as a result of conduction or radiation from the surrounding environment or due to "self heating" brought about by power dissipation within the device. When a thermistor is used in a circuit where the power dissipated within the device is not sufficient to cause "self heating", the thermistor's body temperature will follow that of the environment. Thermistors are not "self heated" for use in applications such as temperature measurement, temperature control or temperature compensation. When a thermistor is used in a circuit where the power dissipated within the device is sufficient to cause "self heating", the thermistor's body temperature will be dependent upon the thermal conductivity of its environment as well as its temperature. Thermistors are "self heated" for use in application such as liquid level detection, air flow detection and thermal conductivity measurement.